I’m not sure how or why our tradition of fish on Christmas Eve began, but its roots stretch back to my childhood, when we celebrated with close friends. When it was my mother’s turn to host, she very often made a really delicious shrimp and rigatoni dish, accented with tomatoes and feta cheese. Those were long, fun nights with lots of children, eventually their boyfriends, and husbands, and children. There was always a lot of food and wine and a visit from Santa because there was always a very little one who believed Santa really had come early with a special present. Much later, I learned about the Feast of the Seven Fishes, an Italian tradition that involves eating, yes, 7 fishes, in multiple courses. Since my children have been little, we have continued to feast on just one fish, because between Christmas Eve mass, and cookies for Santa, there just isn’t time to eat 7 courses before Santa comes and the kids get up around 5 am. Our Christmas Eve is quieter than the ones I remember, but I’m guessing that will change as our family gets older. In the past, I’ve made a rustic but tasty dish of cod layered with fennel and potatoes. But this year, I was a bit more ambitious and went for the Feast of the 3 1/2 Fishes. All the fish was purchased from Pietro Parravano, our local fisherman who sources us uncommonly fresh fish every week at our farmers market. Perhaps the highlight of the meal, because it was so new, was the fresh shrimp cocktail, which I brined and cooked myself from a recipe in Jacques Pepin & Julia Child’s Cooking at Home. 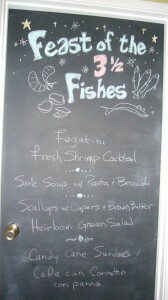 The “1/2” a fish was the anchovies in the fegatini, a chicken liver pate that’s a staple in in our home. These preceded an elegant, fresh Sole and Broccoli soup that we all love–even Finn. It’s incredibly easy to make and works as well for a busy weeknight as it does for company or a holiday. Here’s how it worked: Ella and Finn gorged on the pate, shrimp cocktail, and fish soup before 5 pm Mass. The adults has the pate and shrimp with them. When we came home, Ella and Finn had candy cane sundaes (Vanilla ice cream, excellent chocolate sauce, whipped cream, broken candy cane pieces.) We opened the prosecco and ate soup in the living room by the fire. After the children had retired to bed, we lit the candles, and sat down to the scallops, which were ready–stove to table–in under 10 minutes. It was a lovely quiet night, the perfect moment of stillness before the joyful storm of Christmas morning. 1. Bring the broth, water, and garlic to a boil. 2. Add sole and simmer for about 10 minutes. Fish will begin to break up. 3. Add broccoli and pasta. You can use just the heads or heads and stems. I like both. SImmer for another 5-7 minutes, until the pasta is tender. 4. Serve with fresh olive oil and lemon juice. 1. Sear your scallops in olive oil for 2-3 minutes on each side & remove from pan. 2. Deglaze the pan with about 1/4 cup white wine or dry vermouth, if you’re in an Italian mood. 3. Add abou 4 tablespoons of butter. When the butter has melted and finished bubbling, add the scallops back to the pan. Squeeze in the juice of 1/2 lemon, add a sprinkling of capers. 4. Serve immediately, with bread for dipping, or on a bed of mashed potatoes.